ProduceGood's food-recovery program, Market Share, combines the fun of farmers markets with volunteering and picking up fresh, healthy produce to feed a wide-variety of San Diego's food insecure. These people include children, seniors, veterans, low and no-income individuals, people in recovery, and those who often struggle to meet their basic nutritional needs. You will be helping us divert food from landfills to feed those in need by picking up the fresh produce from vendors at the La Jolla Open Aire Market and then delivering the harvest to our receiving agency in La Mesa. 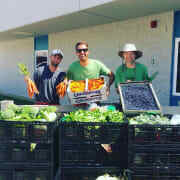 We operate our Market Share program at the La Jolla Open Aire Market (on Girard Ave.) every Sunday from 12:00pm - 2:00pm. Delivery of the harvest to our receiving agency takes approximately an additional 30 minutes. We are looking for individuals to help us in a one-time capacity, or in an on-going volunteer position. We have successfully delivered harvests in 2 door cars but 4-door sedans, SUV's, or trucks would be preferable. Please contact garth@producegood.org for more information. Approx. 3 hours on Sunday afternoon.